Royce’s creed of excellence could very well be applied to the four greats who grabbed their semi-finals spots Wednesday at the Al Arabi Sports Club in Doha on the penultimate day of 2018 World 9-ball Championship. On a day of championship 9-ball pool of surreal quality, Carlo Biado, Shane Van Boening, Joshua Filler and Alexander Kazakis all wouldn’t take no for an answer, all reached for greatness, all excelled beyond the rest. The four superstars now head into the final day on Thursday with an equal chance of entering pool’s pantheon of greats. Biado, who won here last year, is already there, and will hope to become the first player since Earl Strickland 27 years ago to win back to back titles. But first the Filipino will have to match wits with the USA’s Shane Van Boening, who seems destined to finally snap off the big one. In the other semi-final, young German hot shot Filler will look to fulfill a dream many thought he would one day reach, but perhaps not at just 21 years old. But to get there the fast and loose playing Filler will have to battle through Greek workhorse Kazakis, who simply never knows how to quit. Both race to 11, alternate break semis will be played simultaneously beginning at 11am Doha time(GMT +3). The race to 13 final will break off at 3pm local time. Despite his soft spoken and humble nature, Biado has to be the favorite of the final four, if only slightly, due to several factors; he knows what it takes to reach the mountain top, he plays under the radar, and he is playing the best pool of his career. In the round of 16 match that began the day, the 37 year old Biado came up against 2005 World 9-ball Champion Wu Jiaqing. The pair dueled for 90 minutes, breaking and running numerous racks. But when Wu scratched while down 9-8, the champ did what champs do; he closed the door and won a hard fought battle, 11-9. The Filipino then came up against Taiwan’s rising player, Wu Kun Lin, who had disposed of Finland’s Petri Makkonen earlier. These two had history and it was to Biado’s favor for Wu was the very player the Filipino handily beat in last year’s semi-final on his way to the title. The result Wednesday was nearly identical. Firing on all cylinders Biado streaked out to a commanding 6-0 lead and never looked back, winning easily 11-4. All photography courtesy of ©JP Parmentier - Matchroom Multi Sport 2018. USA’s dramatic partypoker Mosconi Cup victory was witnessed by record viewers around the world and the highest live gate in the tournament’s history with close to 2,500 fans packed into Alexandra Palace, London each night as America defeated Europe 11-9 to win back the famous trophy. Shown live by networks in over 130 countries worldwide, the drama of the 2018 partypoker Mosconi Cup was enjoyed by viewers across the globe. In USA, Central and South America and on the Indian Subcontinent the tournament’s partnership with Facebook meant fans were able to enjoy a free live stream, which was seen by over 2million people. The continued growth of pool’s biggest tournament was further evidenced online, where the partypoker Mosconi Cup’s digital footprint continued to expand, reaching and engaging with more fans than ever before. Already, tickets for the 2019 partypoker Mosconi Cup - to take place at Mandalay Bay Resort, Las Vegas from November 25-28 - have seen their highest ever opening-week sales, with Gold seating sold out. As a result, there will be an increase in both win and appearance fees for the 2019 partypoker Mosconi Cup with both winners’ and runners-up prize money increased by 50%. Emily Frazer, Chief Operation Officer of promoters Matchroom Multi Sport, said: “After our most successful and entertaining year at the partypoker Mosconi Cup, it only felt right to reward the players with an increase in prize money by 50%. “This year’s event reached our highest live attendance numbers, television and live stream viewership and is now ranked as the best event in this sport – and therefore it should be taken to the next level. The atmosphere was electric at the Alexandra Palace and we have our 2,500 fans to thank for this and we only hope to recreate this at the Mandalay Bay from November 25th. Tickets for the 2019 partypoker Mosconi Cup are available now at www.mosconicup.com. Prices start at $48 per session with season tickets at $161 silver. Gold seating is now sold out. VIP Platinum packages are available priced $225 per day or $950 for all four days and include a breakfast buffet, unlimited drinks, VIP seating in the front three rows and much more. Click the image to view the larger poster - use "back" to return here. Up until the very last moments of the round of 32 today, this year’s World 9-ball Championship was notable for its lack of upsets that always seem to be a hallmark of this annual 9-ball extravaganza. That is until Robbie Capito decided he wasn’t going away quietly. Robbie Capito? Yeah, don’t be surprised that you haven’t heard of him. Not many outside of his native Hong Kong have. But this cool headed and fearless 17 year old of Filipino descent pulled off what is easily the biggest upset of this year’s championship, and one of the biggest we have seen in years here in Doha, when he came back from certain defeat and took down the world number one, Klenti Kaci, 11-10, to move into the final 16. Only minutes before, Capito looked like he would be exiting the Al Arabi Sports Club as unknown as he was when entered at the start of his match. He trailed the mighty Albanian 7-1. He then slowly clawed his way back into the match, but it didn’t quite seem enough. Down 10-8, surely the steady Kaci would close out the match and move into the round of 16 on Wednesday. Capito, who had earlier defeated Lebanon’s Mazen Berjaoui in the round of 64, never gave up, and he tied the score at 10 all. 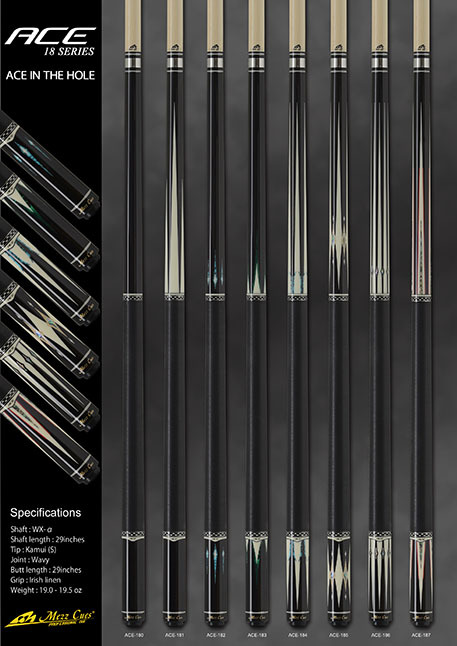 Breaking in the final frame and clearly under duress, he held his nerve and closed out the rack to notch an unlikely win, and an even more unlikely spot in the final 16 at the World 9-ball Championship. Capito, who speaks four languages and is still in high school, will now go on to face Germany’s Joshua Filler when the tournament resumes on Wednesday. (the tournament will have a day off on Tuesday as Qatar celebrates its National Day.) The Hong Kong native will have to reach into his bag of tricks to stop the flashy young German, as Filler has looked unstoppable so far. The German played his trade marked fast and loose style in two easy wins so far, first against Greece’s Nikolas Malaj and then Vietnam’s Nguyen Anh Tuan. If you like the youth movement in pool, you certainly want to pay attention to another 17 year old who has been turning heads this week. Like Capito, Poland’s Wiktor Zielinski is still in high school and can boast world class talent. The young Pole proudly displayed his formidable wares today in two solid wins, first against fellow Pole Tomasz Kaplan, and then the Philippines Johann Chua. It will surely be fascinating to watch how Zielinski handles the likes of Albin Ouschan in the round of 16. The Austrian, who won this event in 2016, is playing top notch pool and looks impervious to the pressure. Ouschan’s two strong wins today showed he has the goods to go all the way this year. 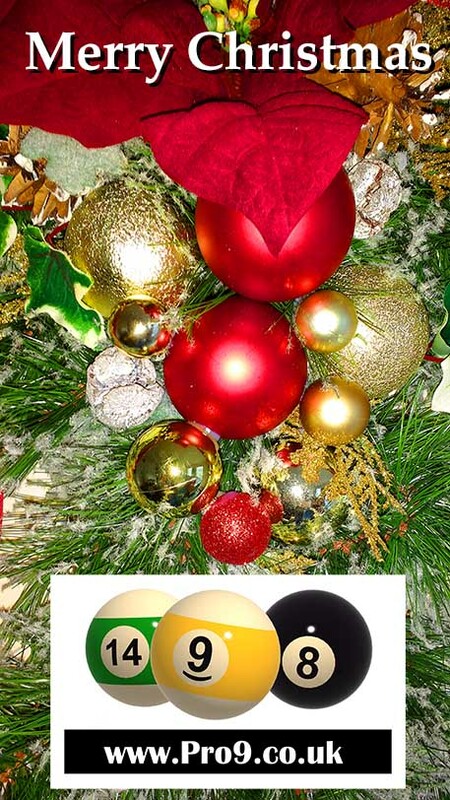 Shane Van Boening has never won a World 9-ball Championship. He did, of course, come ever so close, finishing runner up in 2015, and 2016. After skipping last year’s championship, however, there is a palpable sense in Doha that the American star is absolutely destined to finally grab the world crown in 2018. Interestingly there are eight former World 9-ball Champions in this year’s field, all of them still highly capable of pulling off the impossible feat yet again. But nobody is yet talking about them. It’s the moniker ‘SVB’ who is on everyone’s lips. Van Boening has admitted that he is playing his best pool perhaps ever. After a grueling six month training regime, he led Team USA to a thrilling victory in the Mosconi Cup last week. He showed up in Doha saying he intends to win, and that he is playing with zero pressure on his shoulders. Fans in Doha, and the pro pool community itself seem to agree something is afoot. While most players played in the relative obscure quiet of the cavernous Al Arabi Sports Club on day 1 of this year’s championship, Van Boening’s time in the arena today actually drew a fair amount of watchers. 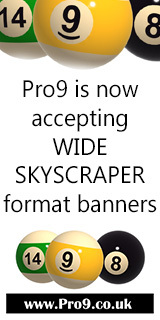 Everyone and anyone who likes pro pool around here seems to feel something special is afoot. The American didn’t disappoint in his first outing, as he crushed Poland’s Marek Kudlik 9-1. 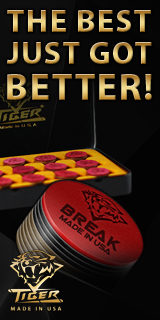 Good breaking, solid potting, deft safeties all showed up in Van Boening’s arsenal today. Combined with his quiet confidence, SVB laid down an early marker stating that nothing short of victory in Doha will suffice. As all 128 players saw action on the first day of the 2018 World 9-ball Championship, it’s clear, though, that Van Boening will have plenty of serious contenders just as eager and capable of taking the crown on December 20. This year’s field is positively stacked with ferocious talent, both young and not so young. With the Wiraka tables breaking fairly easily—wing ball down, 1 in or near the side pocket—it’s all going to come down to who can handle the almost impossible pressure. Pool fans are in for a real treat over the next six days. One of the toughest fields in years is set to do battle as the 2018 World 9-ball Championship kicks off in Doha, Qatar, Friday. After the raucous excitement of the Mosconi Cup last week in London, the pool world is now braced for a completely different kind of intense and nervy action, as the 2018 WPA World 9-ball Championship gets underway Friday at the Al Arabi Sports Club in Doha, Qatar. If past years are any measure, there won’t be huge crowds in Doha. But, still, fans will be treated to an incredibly explosive field of the world’s very best pool players doing battle to see who will be crowned king of the 9-ball universe. 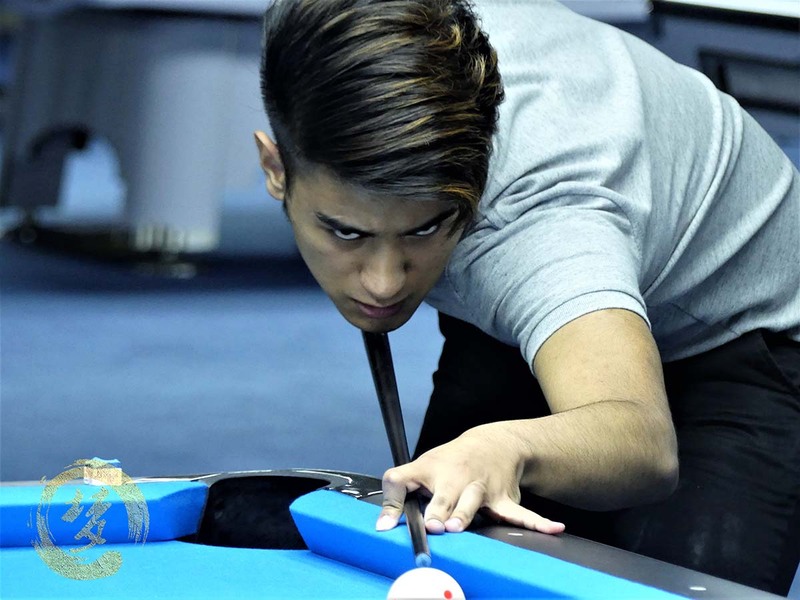 This will be the 9th straight year that the tiny Gulf country, through the government sanctioned Qatar Billiards and Snooker Federation(QBSF), has put its full backing behind the sport of pool’s most important event. As is standard, the tournament will be run in two brutally difficult parts. The group stages will run from Dec. 14-17. The players will be broken up into 16 groups of 8 playing a race-to-9, alternate break, double elimination format. Four players from each group will make up the final 64, which marks the start of the always tense and dramatic single elimination phase of the tournament. Matches will then become race to 11, alternate break. The final, which takes place on December 20, will be a race to 13. 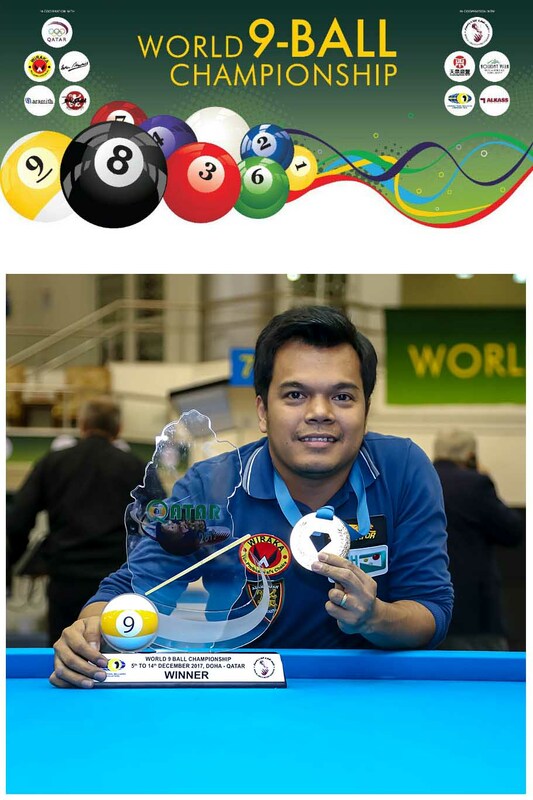 The defending champion is the Philippines' Carlo Biado, who became the first Filipino since Francisco Bustamante in 2010, and the fourth Filipino ever, to win the World 9-ball Championship. Biado won his first world title with a convincing win over fellow Filipino Roland Garcia in the final. Only eight Filipinos make up a somewhat smallish contingent this year but we can rightfully expect one or more to go far in the event. Besides Biado, Pinoy cue fans should look out for Garcia. Just a few days ago the Pampanga native stormed through a stacked field of great Pinoy cueists to win the Manny Pacquiao Open in General Santos, Philippines. With a second place finish last year, and a hot hand this year, Garcia certainly looks like he has the goods to go all the way. 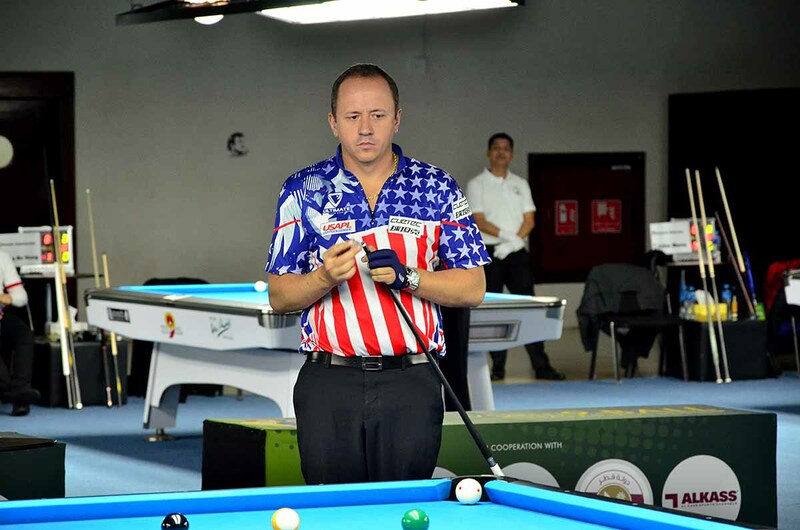 It seems most fans have their eye on the USA’s Shane Van Boening, and for very good reason. After Van Boening pocketed the winning 9-ball in last week’s Mosconi Cup in London, he has admitted that he has arrived in Doha literally brimming with confidence, and is playing under absolutely no pressure. And don’t forget, while Van Boening skipped last year’s event, in both 2015 and 2016 he lost in the finals. It’s no wonder that odds makers have made the American star their betting favorite. There are currently, 130 guest(s) and 0 member(s) that are online. Page took 0.077103 seconds to load.